When a Uranus cycle comes along and effect us, we are in for excitement, originality, acceleration, shock, along with sudden and unexpected events that take you out of the harmony of your everyday reality structures. The old gets swapped for the new. as this energy is different and will take you off the beaten path. 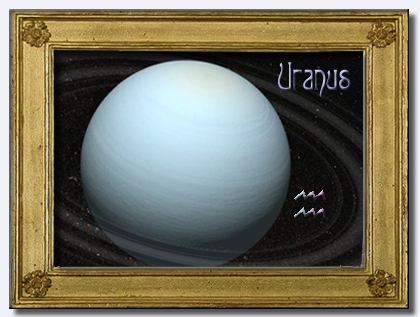 Uranus can be a barbaric force that creates radical, dreadful and brutal changes. Uranus was together with Mars in the Midheaven, or at the noon shy position, when the atomic bomb was dropped on Hiroshima. Uranus is the unexpected, one of the most important things to remember about this cycle is that eight times out of ten the events that happen are ones that you didn't think about at all! Uranus cycles properly used are one of the best going. It creates extraordinary instinct and mental ability, prophesy, and telepathy. He would like you to awaken. Astronomically the planet Uranus takes approximately eighty four years to make one revolution around the Sun and therefore makes one revolution around a Birth Chart in the same amount of time. Uranus is also different in that the Celestial poles of the planet are facing the Sun, while all the others face North and South on an angle much like a spinning top. The planet Earth has its poles at a 23 degree angle. Also the scientists can not figure how the Wind currents move on Uranus, they do not move in relationship to the celestial and magnetic poles, the way the wind currents move on the other Planets. This is causing breakdown in the previous scientific beliefs as to how these things work. It's a wrench thrown into the theory. There are four major Moons revolving around Uranus. Each one of these Moons has something about it that breaks the scientific theories down. In other words Uranus obeys laws of its own as it were, breaking down all previously believed theories. This is also how Uranus works Astrologically. The three outer most planets (Uranus, Neptune and Pluto) represent the collective unconscious of humanity. Uranus is the bridge. You can actually see Uranus with the naked eye when the earth is inbetween the Sun and Uranus during a new moon period. This indicates that there is more of a conscious link involved. Uranus symbolizes all that is new, fresh, exciting and strangely unfamiliar, creating the urge for novelty so strongly as to leave you with no internal and or no external peace. It has the ability to uproot you and place you in a totally new and different environment in the twinkling of an eye. A main point about most Uranian cycles, is that of awakening, and bringing to consciousness, what is just outside of the conscious mind. This new found awareness is usually projected onto the environment in some way. Say a new relationship comes along. This relationship will allow you to experience new feelings and attitudes in freedom and individuality that you haven't yet experienced. This cycle is unstable and the relationship is likely to dissolve when the cycle ends, as most often happens, as you begin to realize that the new person really didn't have or wasn't what you thought they were during the cycle, it was projected by you so as to self awaken. This is not always the case, some relationships that start during this time will stay, but will always demand a great amount of freedom and movement. If they are based on truth then it will last. There are ways, astrologically to know the difference, but this is not included in the scope of this work now being presented. Uranus breaks down the fixed structures that you have built up over the years in order to have some regularity, predictability and stability. This is done by sudden events and sudden flashes of insight from a higher order increasing your awareness and opening you up to new horizons with an attitude of freedom and liberation. This energy can be applied so as to solve old problems with new and innovative solutions, by applying the new attitudes, new insights, and new ways of thinking that are now entering your life at lightening like speeds. This is the energy cycle of extremes of all kinds. Any extreme, carried to an extreme, will cause a tremendous revolution in ones structure, as people that are involved with you especially intimately, will become uneasy, unsure, and will consider that you are now unreliable, flipped out and crazy. This cycle and energy can be used to carry out an idea to the point that it is inhuman and ruthless. Real positive change is brought about slowly with proper application of Understanding, Wisdom and Knowledge and without creating total havoc everywhere in ones personal life unless you wish to totally destroy or remove yourself from the conditions that you have been living with up till now. As always the choice is yours. These energies only urge, they do not force anything. The thing to watch for is that this energy doesn't get out of hand creating an erratic quality that negates maturity and order, just so as to be a rebel for rebellions sake. Order is a necessary thing. The universe is all in harmony and order. It is only incorrect or negative order that must be eliminated. It's correct to create change so as to incorporate your own uniqueness and nature into a structure, and not to allow the structure to have a suffocating effect on you. Also the structure should not allow you to suffocate it, as this would be equally incorrect. Balance and mutual benefit is really the only way things work correctly for the good of all concerned. One persons growth should not be at the expense of another. If this is happening then something is amiss and more understanding, knowledge and wisdom are needed in order to resolve and balance the situation. Some people seem to look for excitement and novelty by escaping the humdrum, into the phoney and fanciful, in partying, going to movies, playing make-believe or anything that is a distraction, in order to escape the real truth, and themselves. This leads nowhere and defeats the purpose of this cycle by avoiding the creation of your own distraction in order to give birth to your own inventive and creative nature. The truth, which is very elusive indeed, is usually found right under your nose, and not in some other place. In general this cycle can lead to being unorthodox, impatient, unstable and unreliable looking for new stimulation, feelings, ventures and excitement. Uranus is a super cure for boredom, frustration and removing oneself from the rut. On of the main things to remember during strong Uranian cycles, especially when it's close to being exact, is to stay as flexible as possible because unexpected things, like all your appointments may change and nothing will work out as planned.